SHANE ESSON of Midland Transport has been a true leader in the trucking industry, as well as when it comes to community involvement and corporate giving. Shane will be retiring in December 2018 after a long and successful career. In his 5 years as a Director of Trucks For Change Network, and over many more in the transportation industry, Shane has not only built a culture of giving at Midland, but has also galvanized industry people and organizations throughout Atlantic Canada through events like Truck Pull For United Way, 18 Wheels of Christmas, and many others. Shane, THANK YOU for helping to make Trucks for Change Network what it is today, and on behalf of the countless charitable organizations you have helped to make our communities a better place to live and work. We wish you well in your retirement, and we’ll miss you! 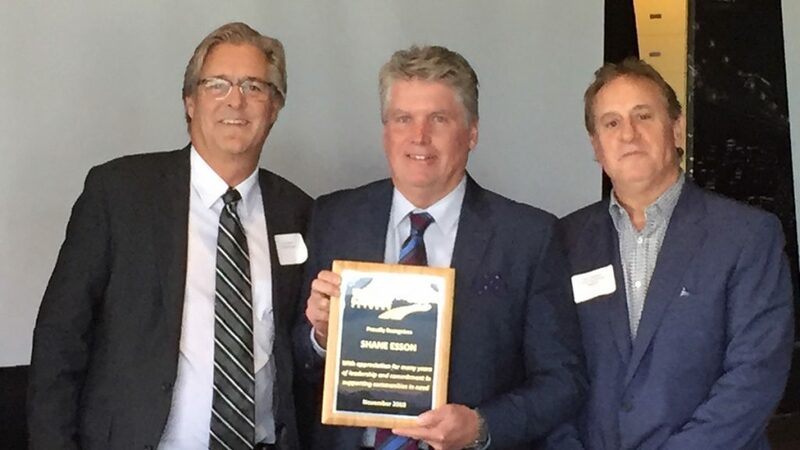 Above: CTA Chair Scott Smith (left) and T4C President Pete Dalmazzi (right) recognize Shane Esson (centre) for his years of devoted leadership to supporting communities.